On the heels of winter's thaw, springtime blooms signal that families are planning getaways for Easter weekend and spring break. Here are great ideas for an April getaway with kids. For legions of kids in the United States, spring break is a week-long hiatus that falls anytime between mid-March and mid-April. It's a great opportunity for families to shake out of their winter gear and think of warmer times ahead. The nation’s capital is worthy of a trip any time of year, but in early springtime the city is at its most spectacular. 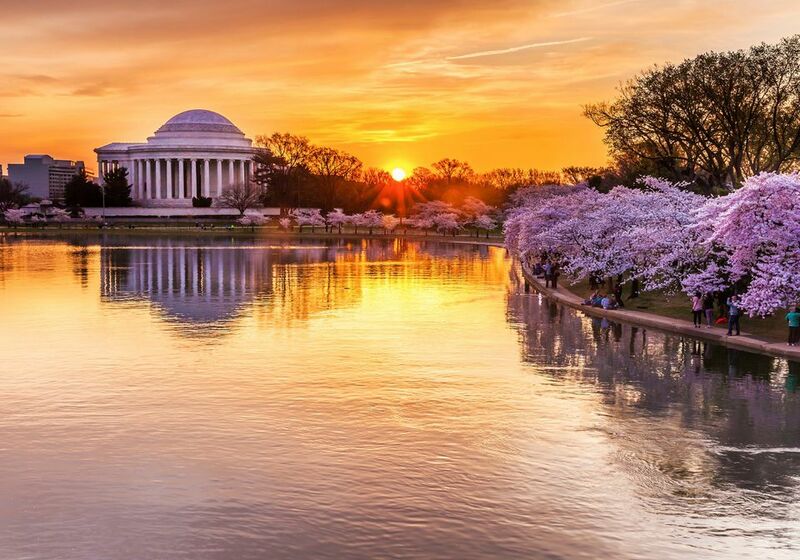 Every year from late March to mid-April, millions of visitors head to Washington, DC during the Cherry Blossom Festival to see thousands of cherry trees in bloom along the tidal basin. Dates vary from year to year, depending on the weather, but the average peak bloom occurs around April 4th. Looking for Easter hoppenings? Here's where to find hotels and destinations that are hosting egg rolls, bunny visits, lavish Easter brunches, and much more. For many school kids, Easter weekend falls over spring break, providing the opportunity for a longer family getaway. The transition from winter to spring is a truly sweet time to be in New England and Canada. March and early April make up maple sugaring season, when buckets appear on maple trees and sugar shacks transform maple sap into delectable maple syrup. Disney World is celebrating spring with its annual Epcot International Flower & Garden Festival held from March through May. It's a wonderful bonus that's included with your regular park ticket. The annual event is a highlight of Disney World's springtime calendar, bringing spectacular landscaping and amazingly creative topiaries to Epcot. Got spring fever? Pack the car and grab the kids for these stunning road trips that take advantage of the winning combination of wildflower blooms, fabulous scenery, and ideal weather. This annual citywide celebration of San Antonio’s rich history, culture and heritage ​takes place April 18-28, 2019. The festival comprises more than 100 Fiesta events, including 11 different parades, multi-cultural food, music and dancing, arts and crafts, lavishly dressed Fiesta royalty, and more. Is your kid fascinated with snakes? Plan a bucket-list trip to the Narcisse Snake Dens in Manitoba where you'll find the world's largest concentration of harmless garter snakes. Every spring, the dens come alive with tens of thousands of red-sided garter snakes as they slither to the surface from their winter dens. Temperate weather and a calendar full of fun make April a fantastic time to visit New Orleans. The festivals go on all month, from Pyrate Week (which actually lasts two weeks, not one) to the French Quarter Festival, New Orleans Jazz Festival and, finally, the New Orleans Giant Puppet Festival.